400 tons of snow?? Really? And we are going to see it? 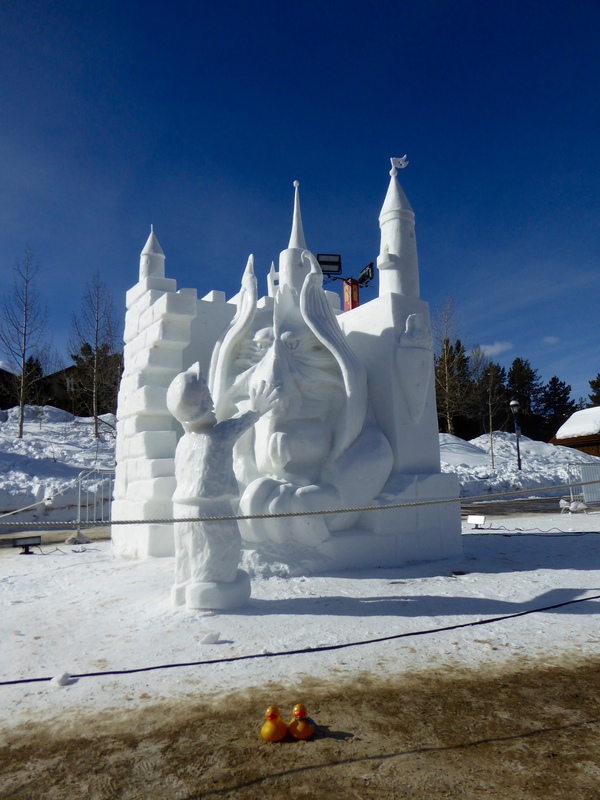 Back to Breckenridge, Colorado we happily view these entries for the 27th annual International Snow Sculpture Championships. We love this event. First place was awarded to Team China for Mermaid. These mermaids look like they are underwater. Second place belongs to Team Sweden. Titled: 4 (Ever) Wheels Reflection. 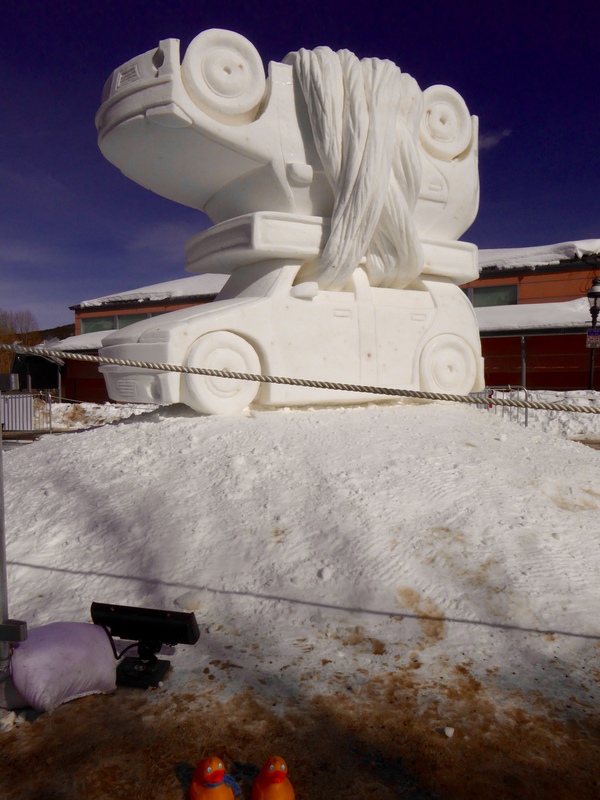 Team Sweden wrote “This sculpture is a reflection of the car as a cultural tool and an extension of our bodies. The car constitutes the duality of freedom and dependency.” OK, so how did all this snow get here? 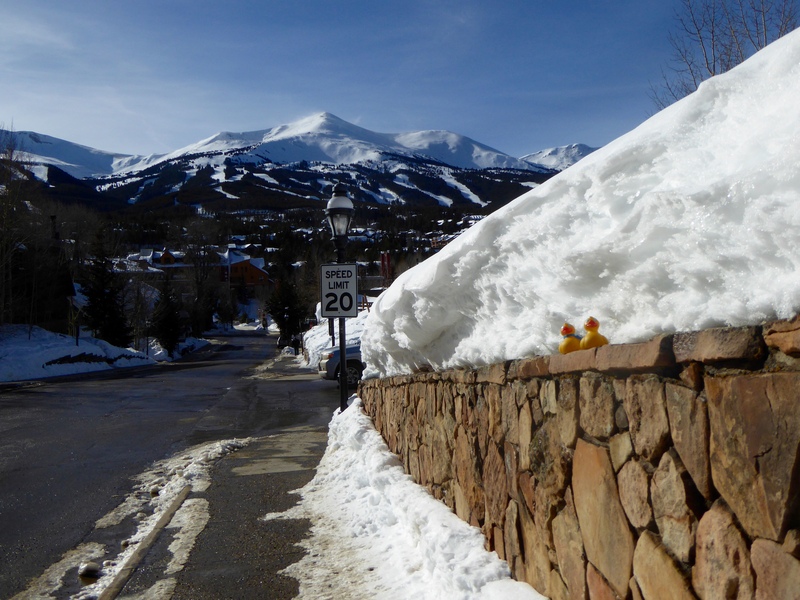 Breckenridge is a ski resort and they made the snow. 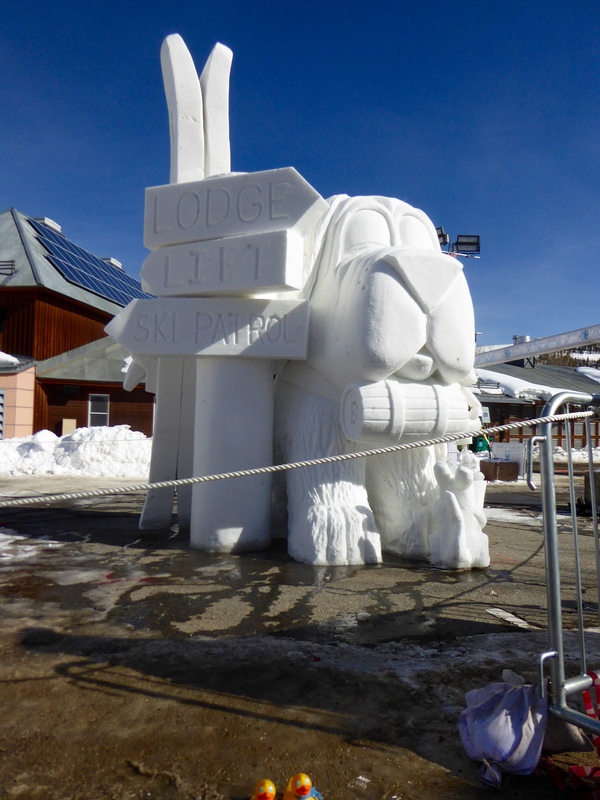 The City of Breckenridge hauled snow, in dump trucks, to the sculpturing area. 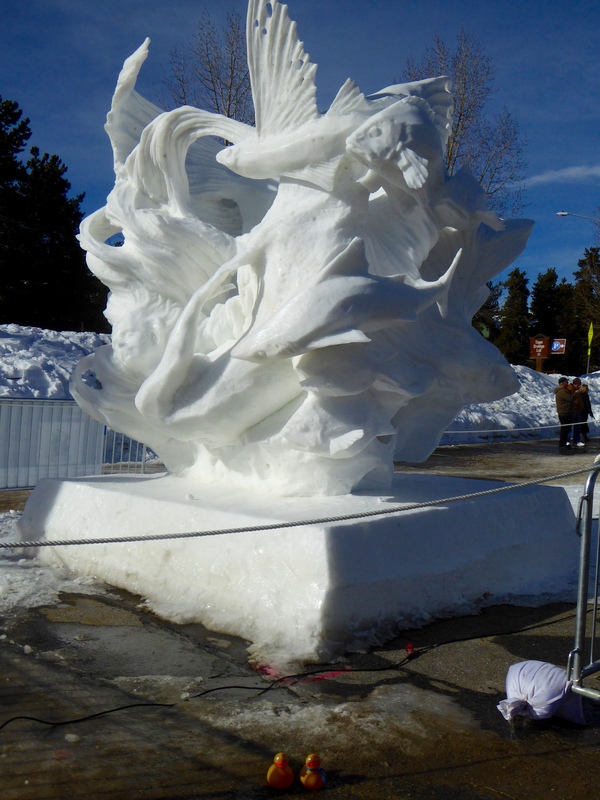 The snow, dumped into forms, is packed by humans jumping on it. 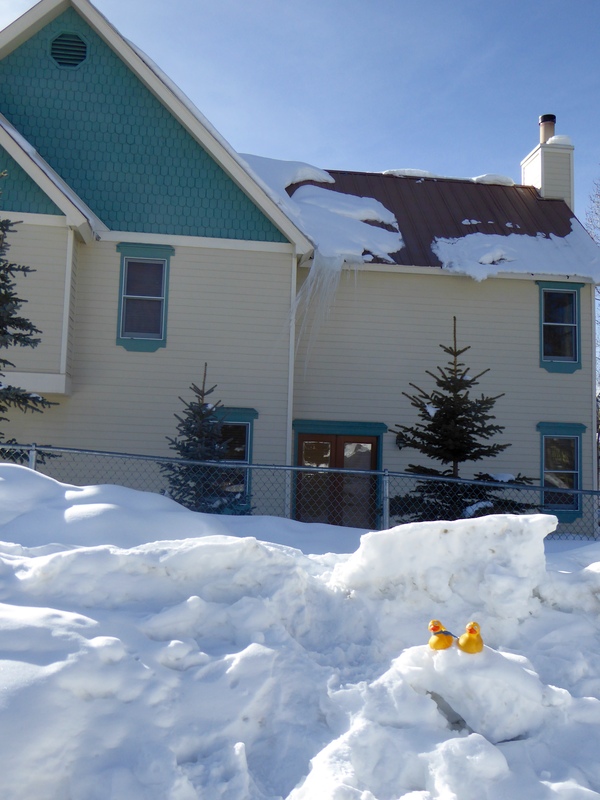 Each block of snow is 10’x10’x12′. Each of the 16 blocks weighs 50,000 pounds. 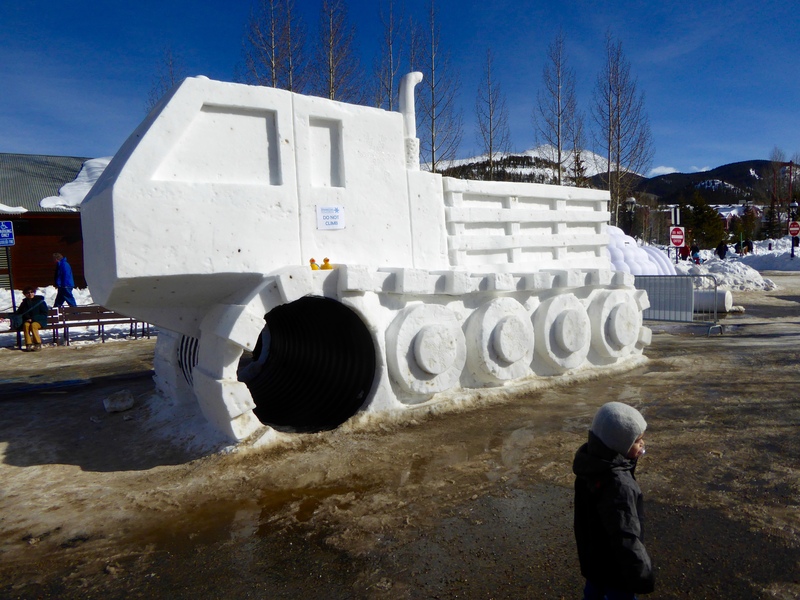 That is 400 tons of snow! Third place went to Team Mongolia for We are One Family. This seems to be the front of the sculpture. But, the back and sides were a bit different, and Zeb and Soapy want you to see this view also. Also awarded is People’s Choice award. Spectators vote by placing one dollar bills in the voting boxes in the Thaw Lounge. This year was the first time there was a tie vote. And, the two winners were Team Mongolia for We are One Family (also third place winner), and another Team Mongolia for Before It’s Too Late Protect Earth From Today! 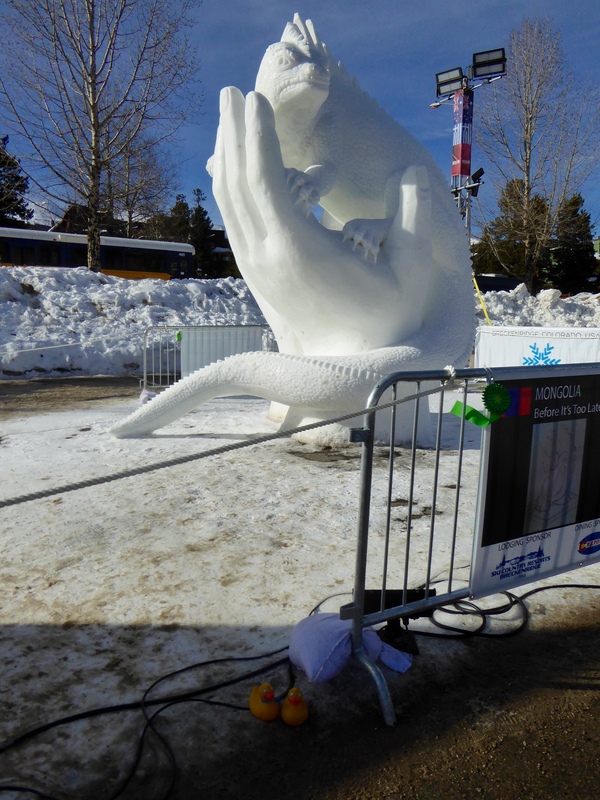 Team Mongolia’s sign says “This lizard on a human palm represents the intertwindedness of humans with nature.” This was our favorite sculpture this year also. We really liked all 16 of these entries. Team Iceland’s, Ancestry In Ice was great. The Viking ship was perhaps the greatest technical and artistic achievement of its time, they say. Team Italy names this STOP! They believe our worst enemies are within ourselves: They are our own fears. 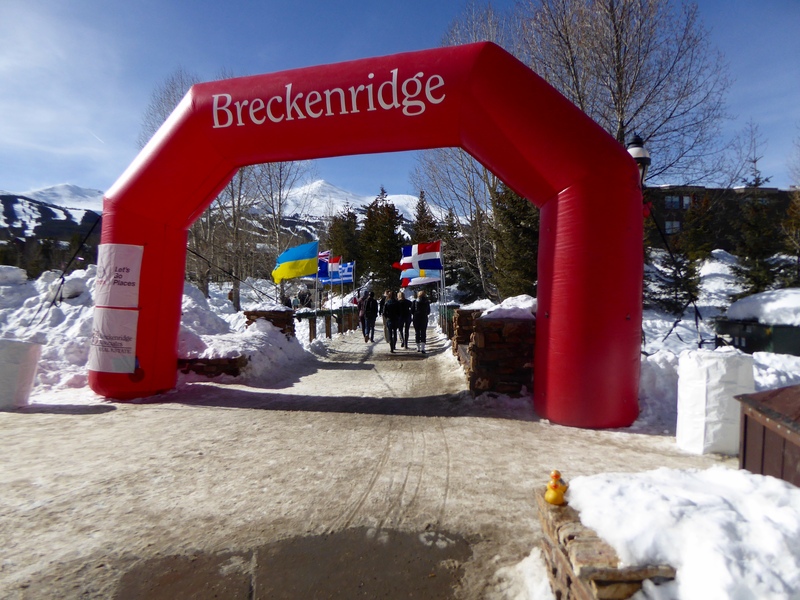 Team Breckenridge, the host city, entered Life Saver. This is a tribute to the National Ski Patrol, established in 1938. The National Ski Patrol provides eduction and emergency care and safety eduction. They also are the main Search and Rescue group for the mountains. We thank the over 28,000 members, serving over 650 patrols. But not all snow was entered in the competition. This one is for fun. At first, kids could play and climb here, but then the weather got warmer, a little thawing, more freezing, and now it is covered with a layer of ice. Still climb inside, but outside is too slippery now. This year there is a new sponsor. 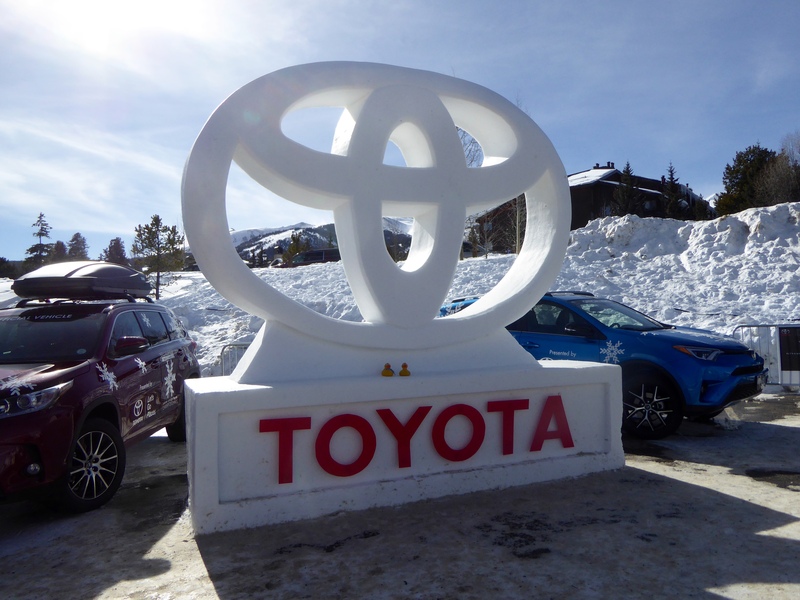 Toyota sponsored this 27th International Snow Sculpture Championships. For the competition, no power tools are allowed, only small hand tools. 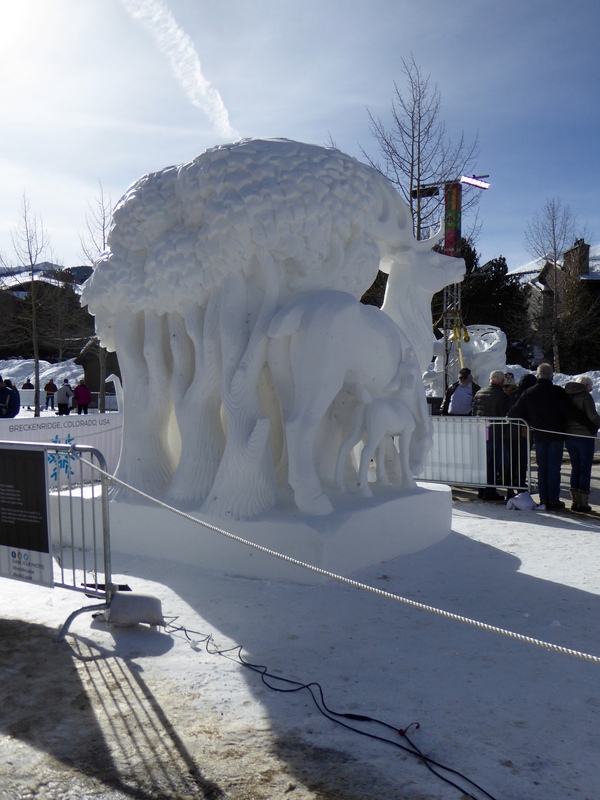 The sculpting began Tuesday at noon and the ended Saturday at 9:00 a.m. Then the judging begins. Many teams work through the nights to finish these masterpieces. But, remember this is a mountain town, a resort town, a ski area, and a great place to visit. On main street we like this Colorado Store. 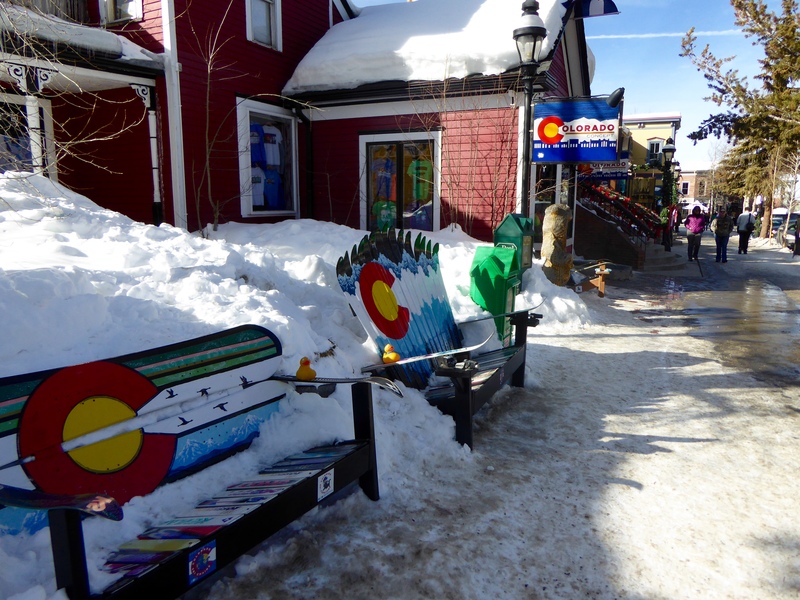 And we especially love the benches made of old skis. 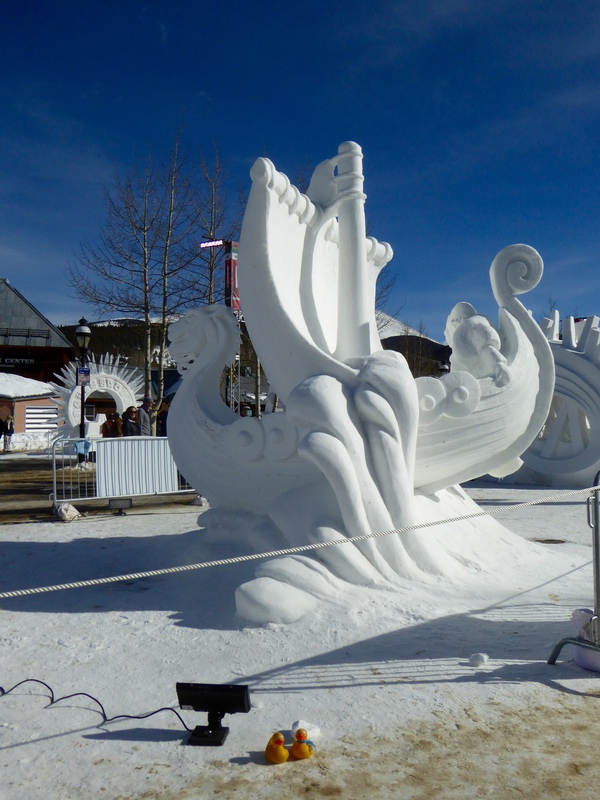 Breckenridge received a lot of snow the week before this competition. Much of it is still here, in town and thankfully on the mountains. Looks like it was windy also. The icicles look like they were blown as they froze. We love Breckenridge. They have many festivals during the year, but it is fun even without festivals, any time of the year. We hope you visit soon. 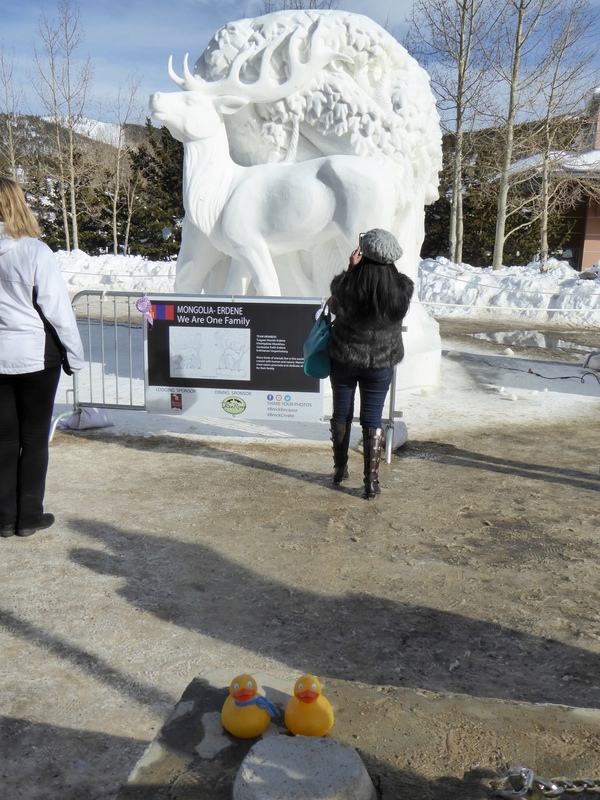 This entry was posted in Colorado, Uncategorized and tagged Breckenridge, Colorado, Colorado Traveling Ducks, Snow sculptures. Bookmark the permalink. Such clever workmanship. I can see why Team Mongolia won the people’s choice. I do like the Viking ship. They were all marvelous. Team Mongolia usually wins an award. We try to visit this festival at least once every year. We love to see the sculptures. Thanks for reading and commenting.